A recent Australian study shows community water fluoridation (CWF) has a beneficial effect on oral health, even after taking into account the known effects of socioeconomic status and sugar consumption. This is important because anti-fluoride propagandists are always pushing the mistaken claim that CWF is based only on “old science” and that “the science establishment” refuses to check these old findings. These propagandists have also latched onto the concern over the effects of excessive sugar consumption on general and oral health to claim that any apparent beneficial effect of CWF would disappear if sugar consumption was reduced. Blinkhorn, A. S., Byun, R., Mehta, P., & Kay, M. (2015). 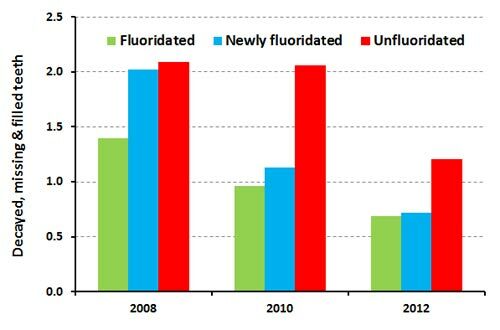 A 4-year assessment of a new water-fluoridation scheme in New South Wales, Australia. International Dental Journal. It followed changes in the dental health of children in Gosford City, NSW, after introduction of CWF in 2008. It compared this with the oral health of children living in areas that had been fluoridated for over 40 years, and with those in the Shires of Ballina and Byron which were unfluoridated and had no plans to introduce CWF. 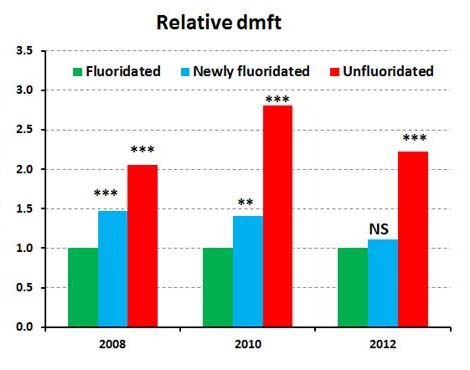 The figure below compares the average numbers of decayed, missing and filled teeth (dmft) of 5-7 year-old children in 2008 (just before introduction of CWF to Gosford city – the “newly fluoridated area) with new batches of 5-7 year-old children in 2010 and 2012. In all three periods comparisons were made to similar children in the unfluoridated and long-term fluoridated areas. Of course, anti-fluoridation activists might pick up on the improved oral health of children in unfluoridated areas in 2012 (and they might even try to ignore the rest of the data). But the clear message is that even though there may be a general improvement in oral health over time the children in the fluoridated areas still showed a clear benefit. sugary drink consumption (poorer dental health where children consumed one or more drinks a day). We can see that by 2012, 4 years after introduction of CWF, there is no significant difference between the oral health of children in the long-term and newly fluoridated areas. However, the oral health of children in the unfluoridated areas was significant poorer at all times. Origins, socioeconomic status and consumption of sugary drinks have a statistically significant effect on children’s oral health. However, even when these are taken into account this research shows a clear beneficial effect of CWF on children’s dental health.